Sausalito, California first caught my attention while I was researching the back story to Otis Redding’s, “(Sittin’ on the) Dock of the Bay”. I was curious about what led him to write it and if he had a deep relationship with the city. The research was a little disappointing. I was left with three tourist trap claims of upon which houseboat Otis penned the tune. I also found other reports that said he only wrote the first verse in Sausalito and that he wrote the rest in a hotel in Memphis, TN. There was some bittersweetness when I found that those same reports suggested Sausalito was a get-away rest stop for him and his band during tour for the album “King & Queen.” So, if he was lucky, he did get a chance to relax and recharge – which seems to be thing to do there. In the end, that backstory is an article for another day, but it tripped my trigger because I now live 40 miles from Sausalito. 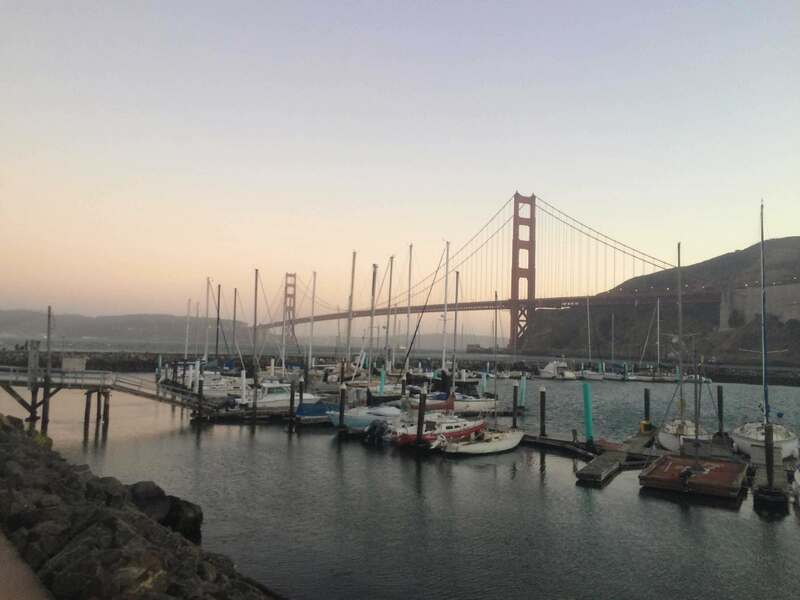 Granted, it takes about 50 miles to get there from our apartment because there’s no bridge that connects Sausalito to Oakland or Berkeley – nor are there plans to do so. You have to either go up to San Rafael or wind back and outwill the congestion of San Francisco. It’s kind of like getting to downtown Chicago from back home, having to wind around Lake Michigan to do it. Point is, it’s too close not to take full advantage of it. I’ve been telling Katie about Sausalito for the last few month, spinning pixies about how it is a little Mediterranean-esque fishing like village that’s been a little commercialized but still has a great artistic base. That’s all she needed to know to go check it out. He started the day at the Golden Gate Recreation Center, drinking with friends and our puppies on the patio at Ft. Baker while I spent the afternoon watch how the sun refracts of the Golden Gate Bridge throughout the day. We crept along the marina as sundown approached as Katie stole moments in time with her camera. Then, pizza sounded good so we made the 2 mile drive into downtown Sausalito. Once we started walking the streets and soaking in the sights and sounds, we got sidetracked by tourists in boat shoes and Nautica fleeces attacking freshly-baked waffle cones filled with homemade ice cream (and, yes, there was Froyo, too). With frequency. When you drive those hills at night, lit up by the rows of houses and augmented by a light fog, you’ll know you’ve found beauty. I first became conscious of Sausalito when listening to recording of old live sets on ConcertVault.com while milling hours at the ole agency. Especially the pre-Margaritaville acoustic sets Jimmy Buffett did on the radio show. The Record Plant in Sausalito would do live broadcasts of artists that would aire over KSAN “Jive 95.” After hearing that set over and over again, I had to Google Map where Sausalito was at that point because I had no clue. I didn’t know that the area north of the Golden Gate Bridge was something other than San Francisco. I thought it was incorporated. When I later found out Otis wrote at least the first verse to “Dock of the Bay” in the same town, I was hoping to discover he wrote it at The Record Plant. Sadly, The Record Plant wasn’t open till nearly 5 years later. So it goes. 1) There’s barely 8,000 people in the city limits. I didn’t see that one coming. Judging from all the Mediterranean-esque pictures, its picturesque location on the bay, ferries to the city, proximity to Golden Gate Bridge, and the artistic community, I was expecting 35,000 or so. Ugh. Couldn’t it have least turned into a Half-Price Books or a hipster coffee house or something? No recording studio that produced Stevie Wonder’s, Songs in the Key of Life should be helping with the downward dog pose. It’s just a tragic transfer of energy. Then again, maybe those go together better than I’m giving them credit for. There’s only one Record Plant now. It’s in LA. As for The Record Plant Sausalito, it has a new owner, new name, and new location, yet it claims the history. I gonna have to go check it out. Apparently there’s a cold war between the yachts who pay and the old boats who live rent-free down the shore in artistic communities. The town council is in heavy talk about short term renters. It was approved in 2012 but now it’s back up for debate. Ugly sucker. Photo credit: Wikipedia. Apparently the Sausalito Arts Festival is something to beholden. Now that we’ve had changes in our travel schedule, we might be able to make it out this year to see just how epic it is. I had no idea they renamed the tunnel leading from Sausalito to the Golden Gate Bridge after Robin Williams. Yeah, that’s me not paying attention to the news. I’ll admit, I got misty when I saw the sign and, for as much as I don’t get caught up in the glory of the bridge, it’s a breathtaking view when one comes out the other side. It’s a town of 8,000 people who live a ferry ride or a Golden Gate Bridge trip to town. Running the numbers, between the vacation-homers and the painters, I dunno the depth of the music scene. They claim it on the city website and I heard a club playing older-style jazz without too much high-hat on the main strip in a place with a sign called, “Bar.” So, when the puppies have a babysitter, we’ll check that out. “Bar” is a bold statement to make and must be investigated. There’s also a Sweetwater Music Hall out there that seems to have attracted a few icons. It’s a few miles northwest up in Mill Valley, but maybe Sausalito gets credit enough for being close enough. Its investors include Bob Weir – which gave it instant credibility since 1972. There’s a music writer in our building who only lives out here in East Bay to breathe for a few seconds before jumping back into the San Francisco scene. He’s a fountain of information. I need to talk to him. That means I’m going to have to veg out that the hot tub the next few nights until he comes back around. I think I’ll suffer through. The feud between the squatters, the vacationers, the artists, the short-term renters, and the actual residents is fascinating to me. It’s expensive enough to try and live up there. I can’t imagine how much the costs are going up for those who tried to retire out there or for those who spent their lives there only to be flushed out by a tech startup charlatan who got paid out before this forthcoming tech bubble popped. And the artists. Aww, the artists who had a quiet little community whose view of San Francisco was close enough to the city for their liking. Now it’s becoming gentrified by those who just like the view. I can’t imagine the heartbreak they’re going through. I can’t wait to go out and meet a few of them to hear their stories, like the guy who’s lived out there 50 years nearly rent-free. And the Pirate community that went legit while others are winning. Hopefully I can find a few that were around for the Houseboat wars of 1971. Here’s some of their fight. C’mon tech and housing bubbles. 7-come-11. I’ll write more as I get it. In the meantime, if there’s something about Sausalito you think I should know, please let me know. Last updated by Finn at August 9, 2016 . Next PostNext The Song at the end of “The Big Short” is “When the Levee Breaks,” by Led Zeppelin.